Tonight the luminaries of the conservative movement and his many friends from church, business and politics will join ConservativeHQ.com Chairman Richard Viguerie for the “official” celebration of his 80th birthday. Richard has been called “The Funding Father of the Conservative Movement,” by longtime friend and associate Morton Blackwell, founder of the Leadership Institute and Virginia’s principled conservative Republican National Committeeman. Mr. Viguerie began his political engagement working for Senator Robert Taft’s campaign for President. His 50+ years of engagement in the conservative movement at the national level has placed him, along with Phyllis Schlafly, author and founder of the Eagle Forum, and Lee Edwards of the Heritage Foundation, among the few of the original battalions that responded to William F. Buckley, Jr.'s call for a national conservative movement who are still active in national politics. And at an age when many of his contemporaries are sitting back enjoying some golf and the grandchildren Richard shows no signs of letting up. Far from being a look back at a successful career and a life well-lived, we expect tonight’s celebration to be a look ahead. Richard is working on two books – one on health and how he says (with a twinkle in his eye) a healthy lifestyle can help conservatives outlive liberals – the other on how conservatives can take over the Republican Party and govern America by 2017. We here at ConservativeHQ.com know Richard as our Boss, at times a tough taskmaster, but also a mentor and wise counselor with an unerring ear and eye for the language and principles of conservatism. Tonight’s celebration will no doubt make much Richard’s fundraising prowess and how his pioneering use of direct mail, and later the internet, made possible the growth of many, if not most, of the organizations that provide the sinews and backbone of the conservative movement today. 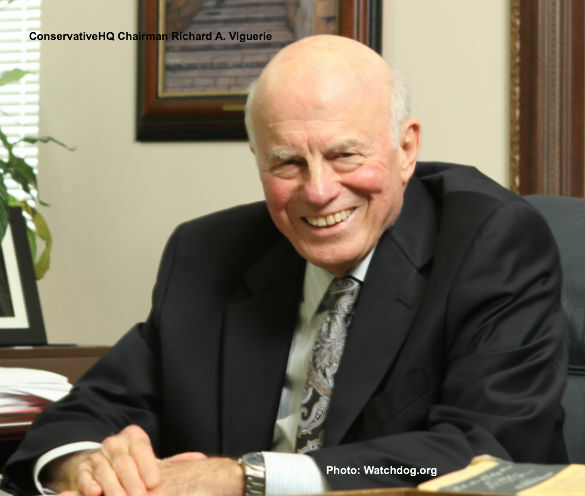 However, it is Richard Viguerie’s commitment to the principles of conservatism, and his willingness to stand for them even when it is inconvenient, that may be his greatest contribution to the modern conservative movement. This commitment led Mr. Viguerie to write “Conservatives Betrayed: How George W. Bush and Other Big Government Republicans Hijacked the Conservative Cause.” “Conservatives Betrayed” took-on an incumbent Republican President and majority in Congress for their failure to deliver on their promises to govern according to conservative principles at a time when all too many national conservative leaders were willing to turn a blind eye to the excesses of the GOP establishment in the hopes of getting a luncheon invitation to the White House Mess or the opportunity to watch the Fourth of July fireworks from a choice spot at the Capitol. This unwavering commitment to principle led Mr. Viguerie to embrace the grassroots activism of the Tea Party at its inception, well before it became a national movement, and to encourage these patriots to take on the GOP establishment and to run for office at all levels of government – and most importantly – to get involved in the Republican Party as local precinct committee members, county, state and national-level party leaders. And it leads Richard to constantly challenge everyone in the conservative movement to examine the policies we advocate and support in light of our values and principles, and to apply those values and principles to everything from defense spending to criminal justice reform to the death penalty. Please join us in wishing CHQ Chairman Richard Viguerie a happy 80th birthday and many more years of taking on – and defeating – the liberal establishment in both political parties. Submitted by skopii on Tue, 09/24/2013 - 06:40. Continued Health and Energy for Your Cause. Submitted by [email protected] on Mon, 09/23/2013 - 21:03. Having shared a gondola with you and Michelle on a Hillsdale cruise a few years back, Isolde and I have been fans of yours ever since. I turned 80 last March---it wasn't bad at all. Enjoy it. Submitted by Julian Alien on Mon, 09/23/2013 - 18:41. Happy Birthday Mr. Viguerie! Let's give them heck some more. Submitted by freeper7 on Mon, 09/23/2013 - 17:29. Mr. Viguerie, would that it were possible to have your gadfly activities around for another 80 years! Barring that, please assure us you are grooming a fit heir! Thanks for all you do to restore this republic! Submitted by Cape Conservative on Mon, 09/23/2013 - 13:16. You have been an inspiration to me as I have admired your strong conservative stance for many years - you do NOT waiver and have shown us the way to hold true to our values. Submitted by dfranke00 on Mon, 09/23/2013 - 13:09. Congratulations Richard! Your perseverance and enthusiasm are a beacon for us all. Submitted by hrh32 on Mon, 09/23/2013 - 10:50. Love the "healthy lifestyle" Conservatives "outliving" Progressives line. We also will outproduce them by not aborting our children.